In the mid-1980’s, I spent a lot of time with Michelle, a seventeen year-old parishioner who suffered from a terminal brain tumor. In the last weeks of her life on Earth, I visited with her every day. It’s difficult to declare God’s love to a dying teenager and her family. It was a humbling way to learn that I cannot give away what I do not have. I had no answers to explain their suffering, and could not pretend otherwise. For weeks, Michelle and I together drew closer to the precipice between life and death. I could be but a fellow pilgrim on that path, not a guide. Michelle’s room was decorated by her loving family and scores of high school friends. It was filled with flowers, stuffed bears, and balloons that reflected their love for Michelle, and their broken hearts over what was happening to her. It was difficult to reconcile that room, with its flowers and gifts that screamed life, with the image of a young girl rapidly departing from it. On the night before Michelle died, I was with her in that room. After Anointing and Viaticum, she held my hand as I grasped for something that would ease her fear, and give her hope. I don’t know what made me think of it, but I told her of the life of St. Therese of Lisieux, The Little Flower. I told Michelle all that I knew of Therese, which wasn’t much. 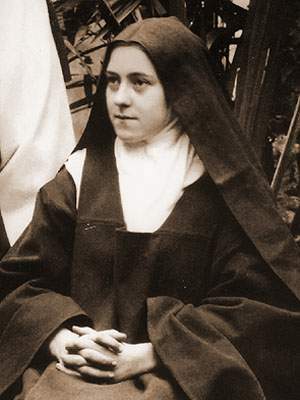 She entered the Carmelite convent in Lisieux at fifteen, and left this world on September 30, 1891 at just twenty-four years old. Her The Story of a Soul became one of the most widely read spiritual biographies of all time. I struggled against tears as I spoke of Therese’s “little way,” and asked Michelle to practice it now by surrendering herself to God. By this time, Michelle had lost her ability to speak. She fought against the drugs meant to buffer her pain, seeming to drift in and out of consciousness as she tried hard to listen to the story of St. Therese. I spoke of St. Therese’s cryptic promise, “After my death, I will let fall a shower of roses.” I told Michelle that I believed the young Therese will meet her on this path, take her hand from mine, and walk with her so she would not be alone. I asked her not to be afraid. Michelle had not opened her eyes for some time. I wondered if she could even hear me. I told her that some people believe they will receive a rose as a sign that St. Therese has heard their prayer for her intercession. Perhaps I was trying to find hope for myself as much as instill it in Michelle. I looked around her room for a rose among the flowers sent by friends, but there was not one rose to be found there. When I looked back, I was startled. Michelle was staring at me intently. Too weak to raise her arm, she rested it at her side, her index finger pointing upward at the ceiling as she continued to stare at me. There was an urgency to her stare that seemed to take all the strength she had left. I looked up. Among the several helium balloons tied to her bedposts, one had broken free and drifted to the ceiling. It was one of those silver foil balloons. Emblazoned upon it was a large, brilliant, vibrant rose. The balloon had arrived that afternoon, her mother later told me. As soon as Michelle could see that I noticed the rose, she closed her eyes. She never opened them again. The next morning, I was with Michelle as she surrendered her life. In the days after celebrating the Mass of Christian Burial for Michelle and her family, I was haunted by the memory of the rose balloon. The sheer miracle of it felt so vivid, so alive at the moment it occurred. I had an overwhelming sense of awe, a sense that St. Therese really took Michelle’s hand from mine and walked with her soul the remaining distance. I never spoke of this to anyone until now. The rose balloon can be easily dismissed now as coincidence, but it didn’t feel that way at first. I could feel what Michelle was feeling as she pointed to it. “Stop looking around my room. It’s right there! Hope is right there!” At that very moment, I felt Michelle’s fear give way to hope. The days to follow stretched into weeks and months and years. My own trials became many, and heavy. They distorted that moment with Michelle, and hid it in clouds of doubt. 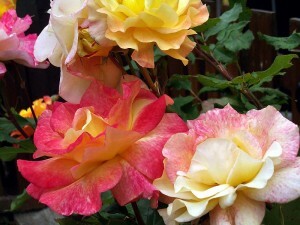 In time, my own tribulations drove Michelle’s rose from conscious awareness. I didn’t forget it so much as it just didn’t seem to matter anymore. Years later, my life and priesthood imploded under the devastating weight of false witness. I spent the eighteen months before my trial living with the Servants of the Paraclete, a community of priests and brothers in New Mexico. One of my housemates was Brother Bernard. He still writes to me. Well into his 70’s now, his Irish wit has not diminished at all, and age has only intensified his simple, trusting – and sometimes irritating – Irish piety. We who serve the Church with advanced degrees in theology and the sciences at times find the combination of sharp wit and simple piety to be, well, humbling. That’s the irritating part. Brother Bernard has a sort of comic book-like league of spiritual super heroes who, in the simplicity of his faith, will always come to our aid. Clearly, the Wonder Woman of his team of saintly rescuers is Saint Therese of Lisieux, the “Little Flower” and a Doctor of the Church. When Brother Bernard writes to me, he doesn’t miss a chance to proclaim that he prays to St. Therese for me. When I lived with him, he loved to take out his collection of St. Therese holy cards and other memorabilia. Now every one of his letters contains one of those cards. We of haughty mind and proud heart have trouble wrapping our brains around the spiritual arena inhabited by Saint Therese. Her “little way” of transforming every moment into a prayer of union with God is hard to relate to when faced with painful and weighty issues – like an unjust imprisonment. In one of his letters a few years ago, Brother Bernard reminded me of that cryptic promise: “After my death, I will let fall a shower of roses.” He told me that I should look for a rose as a sign that St. Therese hears his prayer. I thought of the now distant memory of Michelle and the rose balloon. Whatever it had evoked in my own soul then was gone. I scoffed and mocked Brother Bernard’s letter. I am in prison in the harshness of steel and concrete. Roses do not exist here. In all these years in prison, I have never seen a rose. I put Brother Bernard’s letter aside, and put this pious nonsense out of my mind. Two days later, well before dawn on the morning on October 1st, I emerged from my cell, cup of instant coffee in hand. The cell block was quiet and empty except for one young man sitting alone at a table. As I approached, he complained to me that he had been up all night with an attack of ADHD. A promising artist, the troubled young man had spent the night drawing a card with his treasured colored pencils. “I’ll trade you this for a cup of coffee,” he said as he handed me the card. I sat down. I had to! On the morning of the feast of St. Therese, I was holding in my hand a stunning three-dimensional sketch of a magnificent, brilliant rose.